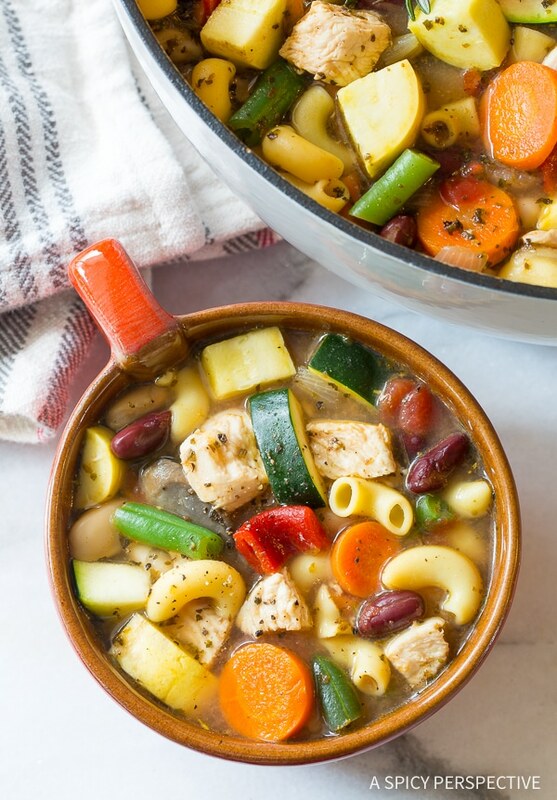 Healthy Chicken Minestrone Soup, a protein-packed version of an Italian favorite! This time of year, when the cold gray days of winter drag on and on crowding out spring… One thing that really lifts the spirits is a piping-hot pot of soup simmering on the stovetop. A good soup fills the house with an herbaceous aroma, creating a sense of warmth and bounty. Soup puts smiles on the faces of family walking in the door from the bitter cold. Soup is something to look forward to. Today’s Chicken Minestrone Soup is a comforting variation of the traditional vegetarian Italian Minestrone Soup. Although I love classic Minestrone, I always feel like it’s missing something. (Ahem, meat.) 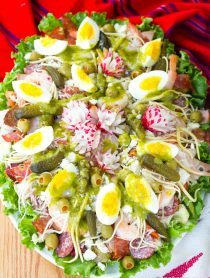 Our version is light and healthy, with added protein from lean chicken breast to keep you full and satisfied. 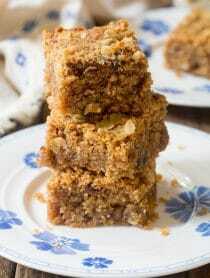 It is also gluten free and dairy free, made with gluten free brown rice pasta, so you can safely serve it to friends with food intolerances. The base of any good Minestrone Soup is a blend of onions, garlic, Italian herbs, and tomatoes. Beans, pasta, and a colorful mix of vegetables are always included. 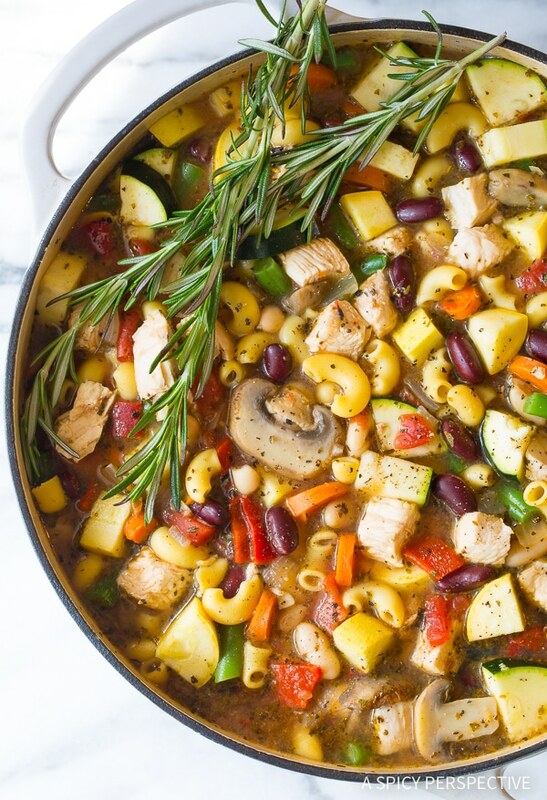 Our Chicken Minestrone Soup is bursting with bold Italian flavor, bright garden veggies, beans, chicken, and pasta. I also like to add a splash of red wine to Minestrone soup, because it gives the broth a deeper richer flavor that complements the sweetness of the tomatoes. 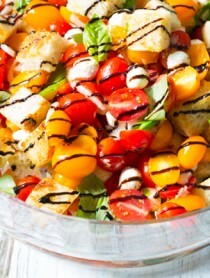 Yet it’s a feast for the eyes as well as the palate. Just look at how gorgeous it is! 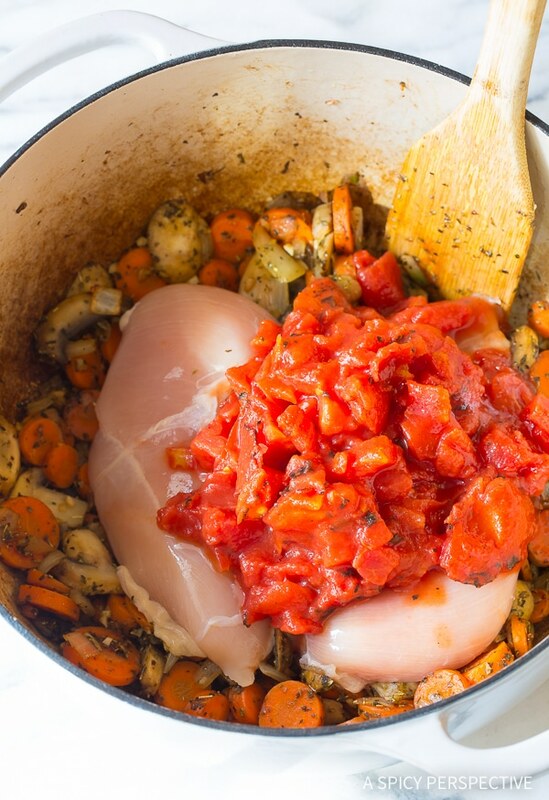 To make Chicken Minestrone Soup start by sautéing garlic, onion, mushrooms and carrots in a large soup pot. Then add whole chicken breasts, herbs, and all the liquid ingredients. Simmer them together to cook the chicken. You may have noticed, I usually cook chicken breasts in soup whole, then cut or shred them later, instead of chopping the chicken raw. This method has three purposes. 1) It ensures you don’t overcook the chicken. 2) It gives you the option of chopping or shredding the chicken. 3) If you prefer chopped chicken to shredded, it makes the chopping much more efficient because the chicken is firm. After the chicken is cooked add in all the veggies, beans, and pasta and cook the soup until the pasta is al dente. Stir the chopped chicken back into the soup and serve! Chicken Minestrone Soup is an entire meal in a bowl. It’s just what you need to perk up your family this season. Healthy Chicken Minestrone Soup Recipe - A zesty chunky classic Italian minestrone soup with an extra dose of lean protein. Set a large 6-8 quart soup pot over medium heat. 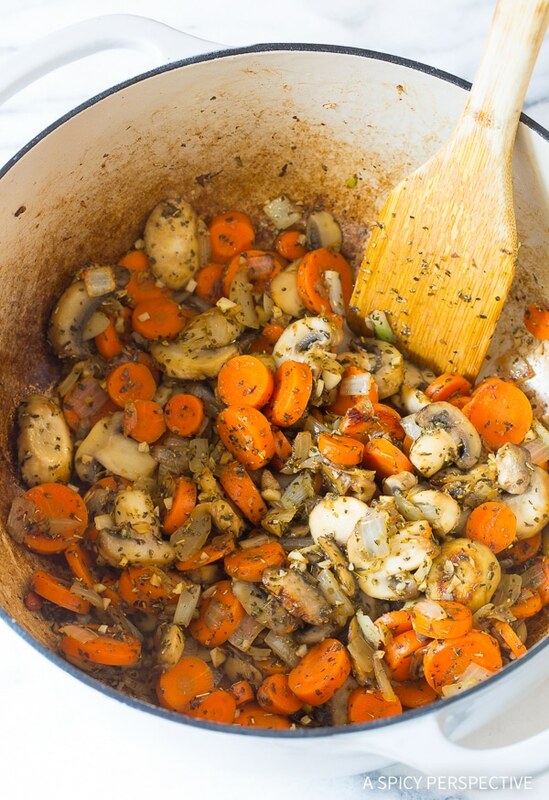 Add the olive oil, onions, garlic, mushrooms, and carrots. Sauté for 5-8 minutes to soften the vegetables, stirring regularly. Place the whole chicken breasts down in the sautéed veggies at the bottom of the pot. Add in the chicken broth, water, canned tomatoes, red wine, Italian seasoning, 1 teaspoon salt, and 1/4 teaspoon ground black pepper. Bring to a boil and simmer for 15-20 minutes, until the chicken breasts are cooked through. Remove the chicken breasts with tongs and set on a cutting board. 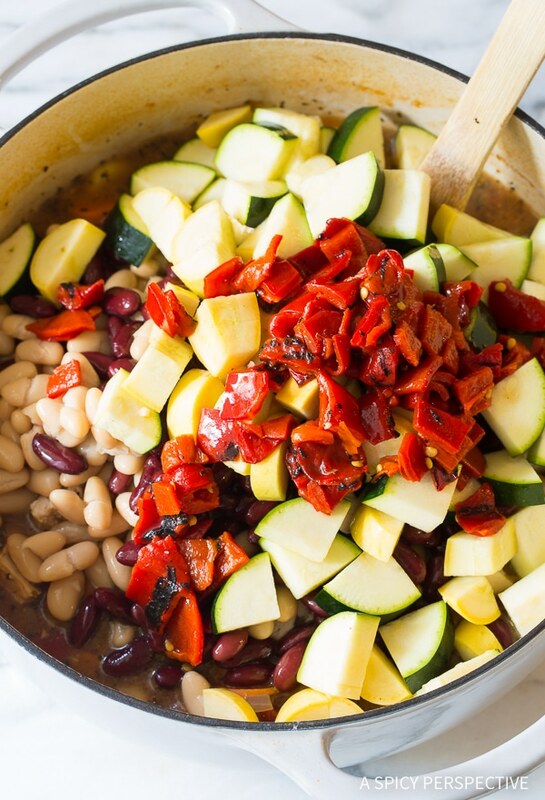 Add the zucchini, summer squash, canned beans, macaroni, green beans, and roasted red peppers to the pot. Stir well. Bring to a simmer and cook for another 5-8 minutes, until the pasta is cooked through. Meanwhile, chop the chicken into bite-size pieces. Stir the chicken back into the soup. Taste, then salt and pepper as needed. I am such a soup lover.